Have you ever heard of a preblessing? I’ve never heard of until this morning when the Holy Spirit introduced me to it. So the investigative side of me Googled it come to find out preblessing is a blessing before hand. From what I read I understand it to simply to be a blessing that is in the works but not yet fully realized. 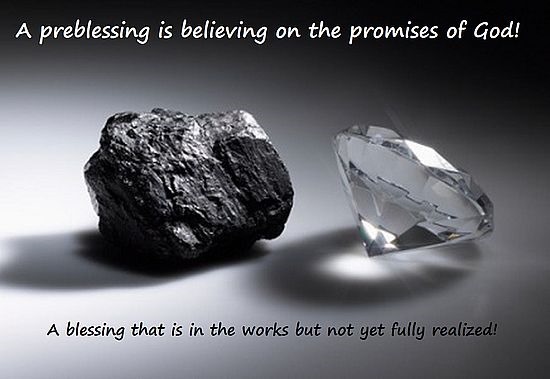 It is believing on the promises of God! A blessing that is in the works but not yet fully realized. Believing on the promises of God. Stop for a minute and think of the impact that can have on your life. At the same time remember the greatest preblessing of all is God’s presence in your life. God preblesses us not because we seek blessings but out of this love and compassion for us. There are times in your life (and mine) when we need to make our needs known to God, and there are other times when all we need to do is sit in God’s presence and allow the Holy Spirit to draw out of us what we really need. This mornings scripture is an excellent example of a preblessing. The shepherds were given the preblessing by the angels. Then later when they stood in the presence of the new born Jesus the preblessing became the blessing. I wasn’t one of the shepherds that night long ago but I suspect as they made their way to the manger their excitement and anticipation grew and grew. This morning God is wanting to give you a preblessing. Grab and open your bible to Psalms 27 and begin reading and allow the Holy Spirit to draw out of you the things God is going to bless you with. Then anticipate the forth coming blessings.